Although Mount Batur is relatively quiet today, this active volcano has erupted a number of times in the past, which is clear to see when you look at the vast black lava fields that spill down the slopes of the volcano. 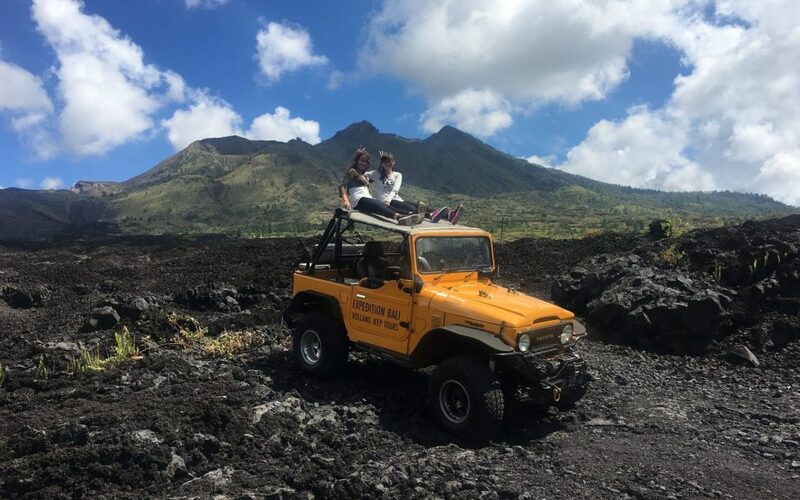 We recently set off on a 4WD Black Lava Jeep Tour to get up close and personal with the lava fields, learn more about the history of the eruptions and unique geologic formations, and scope out secret caves and incredible viewpoints. Our tour started at Bali Sunrise Villas where our driver picked us up in a specially made, tricked-out 4WD jeep with massive wheels, mad engine power, and open-air seats that allowed for great views of the surrounding scenery. Just a short drive from the villas, we turned off into the lava fields that start at the edge of Songan village. As our jeep made its way over massive rocks and along narrow paths through the hardened lava, we began to see the peak of Mount Batur rising above the rubble. Our first stop was at an information board that explained all about the various eruptions and the different lava formations we could see around us including pillow lava, ropy lava, and lava balls. Our guide was quick to answer all the questions we had, and he was happy to let us explore the lunar-like landscape. Next we climbed even higher to about halfway up the mountain to the site of the 1964 eruption where our driver stopped and let us soak up the stunning views of the double Batur cones in the background. He even convinced us to scramble up on top of the jeep so we could get the ultimate selfies with the volcanic cone looming in the background, contrasting nicely with the clear blue skies and black lava fields. Multiple selfies accomplished, we made our way down to the fields at the base of the mountain where local people were farming shallots, tomatoes, and chili peppers. We travelled past the vegetable fields and through a shady forest before emerging at a lookout point that offered panoramic views of Lake Batur, the caldera, Trunyan village, Songan village, and the Batur cones. Our last stop was to a lava tube cave, which the Balinese people consider a holy spot. Wooden steps led down to an opening in the side of the volcano where there was a small shrine set up on the rock platform next to the entrance of the cave. Our guide handed us headlamps and took us inside the cave where you could see crystals sparkling on the black lava walls and cool water dripping down. All up, this was an awesome way to see a different side of the volcano that you wouldn’t normally see on a trek up to the peak. Even better, we got to just sit back and relax in the jeep as our driver took us through this incredible landscape. Next time we’re definitely going to try the Sunrise Black Lava Jeep Tour to see it all from an even different perspective.